What: A good technical running outfit, including socks! Who: Anyone still running in cotton, especially if that cotton is wet, heavy, and stuck to you! Why: When it's hot, you sweat more. Cotton is great at soaking up moisture, which is what makes it such a good material for bath towels. Running clothes? Not so much. Technical apparel and socks, made from synthetic fibers, help to move moisture away from the body, allowing it to evaporate faster, keeping you relatively cool, dry, and comfortable. We carry a variety of apparel at different price points. In general, the more expensive pieces will stretch and adapt more naturally to your movements. But feel free to try on several options and ask us about different features! Why: In the summer, as we start to sweat more, many of us experience chafing. 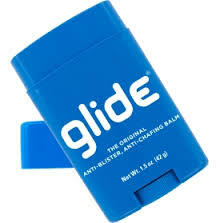 Body Glide, which comes in stick form and rolls on easily, forms a dry, invisible barrier, effective wherever skin is rubbed by clothing, footwear, or skin. Why: Hydration plays a vital role in your training program and affects race day performance. Dehydration is a leading cause of training injuries and hinders nearly every bodily function needed to run. If you're headed out for a run longer than 30 minutes, it's a good idea to bring water with you. We carry a variety of handheld bottles, waist packs, and hydration backpacks from Nathan and Amphipod. While you're in the store, be sure to ask about NUUN electrolyte tablets as well.